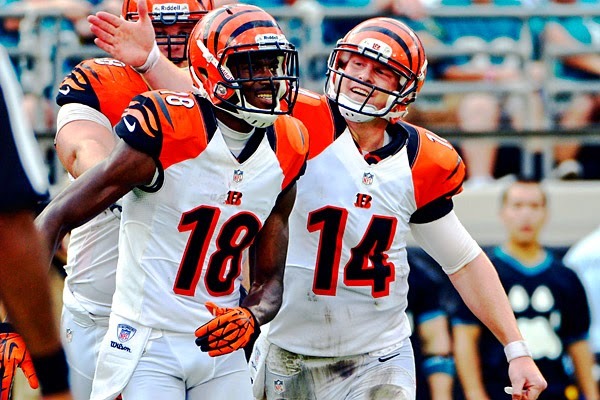 The Cincinnati Bengals are as consistent a franchise as any in the NFL right now. They have a coach that has been there since 2003, talented players at nearly every position, and have made the playoffs for the past three seasons. Unfortunately, the Bengals haven't been able to win in the playoffs AT ALL (0-6 under Marvin Lewis) and fans of the team are starting to get antsy for change. As of right now, the Bengals are going to have a hard time making the playoffs in the tough AFC North. The Bengals have a bunch of talent in their offensive skill positions. Guys like A.J. Green, Gio Bernard, Jeremy Hill, Tyler Eifert are all solid options in this offense. Additionally, the club spent early draft picks at OT this year, adding more talent to this side of the ball. Unfortunately, the Bengals defensive opponents are tough, with Seattle, Buffalo, Arizona, Houston, St. Louis, and Denver on the slate in addition to the six divisional games against Baltimore, Pittsburgh, and Cleveland. We expect the Bengals to produce some fantasy numbers in 2015, but don't expect the world from this group this year. Cincinnati's defense has talented players up and down the lineup, but took a step back last year after losing Mike Zimmer to the Vikings and Vontaze Burfict to injury. The team ranked 22nd in yards allowed and 12th in points allowed in 2014. The Bengals hope a healthy Burfict and Michael Johnson's signing will give the Defense the boost it needs. We expect better production from this group over 2014, but don't predict better than top 10 rankings in 2015.